Have a look at this amazing three bedroom, two bathroom property at Inlet Reef: condo 319. 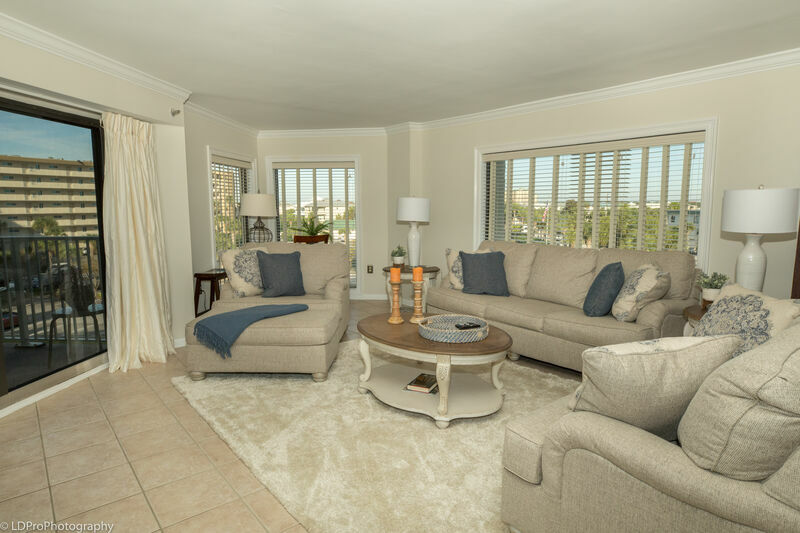 Upon entering the condo you will notice just how open the Kitchen and connected Living Room is. The renovated Kitchen has been tastefully done, complete with custom cabinetry, authentic granite countertops, and stainless steel appliances. The Kitchen also comes with all the pots, plans, plates, dishware, and silverware needed to prepare your favorite meal. There are two dining tables, both adjacent to the kitchen. One dining table seats six, while the other seats four, and there is additional bar seating, ensuring you will never run out of places to dine in comfort. The Living Room boasts a big screen HDTV, a love seat, a couch, two chairs, access to the balcony, and a desk in case you are mixing business with pleasure. The couch in the Living Room also doubles as a Queen Sofa Sleeper to sleep those extra guests. The Master Bedroom is large and in charge, with a King size bed, a flat-screen HDTV, a DVD player, and access to the balcony. The Master Bathroom has a vanity area encased in stunning granite, two sinks, and a walk-in shower. The first Guest Bedroom has a Queen bed and a wall-mounted flat-screen HDTV, while the second Guest Bedroom has two Twin beds and a wall-mounted HDTV. The Guest Bathroom has a granite enclosed sink and a bathtub/shower combination. The bedding in this property allows eight guests to sleep in peace and tranquility. This condo has been updated throughout, and no expense has been spared. The condo also comes with complimentary high-speed Wi-Fi internet access and a full size washer and dryer. Perhaps the best part of this property is the balcony, which is home to an outside sitting table and a wet bar with a sink, and to nice Gulf and Pool views. With all this going for it, book now, and let it be your time to shine in 3-1-9! The unit was a corner unit so it had a little more room and great light. It was sparking clean, well appointed and well stocked. The location was good, close to everything but tucked on a little peninsula so it wasn’t busy. It’s right on the beach so both the pool and the beach were a quick walk. Condo is nice, I have stayed at Inlet Reef before and I really like the location. Need ceiling fans in the bedrooms, but overall nice place.